This may be news to you, but there is a really awesome hip-hop community in this city. So many Toronto show goers are really stuck in one genre or another and would never consider going to see a hip-hop show. That is too bad, because the scene in Toronto is burgeoning. One crew, Backburner, are building a home at Rancho Relaxo. After having played a ton of shows there over the years, Wordburglar and More or Les stepped up and started the monthly 5 Dollar Rap Show. 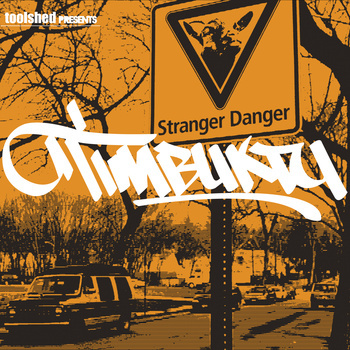 Just last week Backburner artist Timbuktu (of Toolshed fame) released his debut solo album as part of the showcase. The night was insane! D-Sisive played, and even Now Magazine had to take notice. Hip-hop warriors Toolshed have always been at the forefront of the Backburner crew. They started off in London playing with a backing band, and have now evolved to a crew featuring DJ Irate, Fresh Kills, Chokeules and the aforementioned Timbuktu. They are some of the funniest and nicest guys playing music in Toronto right now. And that playfulness and just love for what they are doing shines through on Stranger Danger.I’m not going to drop a review here, because Timbuktu is Rancho family and that would not be quite right. That said, Tim has been gracious enough to let me post a track for stream here so you can check his music out for yourself. What I can tell you is that Stranger Danger will appeal to the part of you that misses old-school hip-hop, the part of you that likes to laugh at hilarious lyrics worked into a song, the part of you that scrutinizes rap to make sure the beats are creative and not derivative, and the part of you that just wants to dance. The album is even loaded with killer old-school style skits! I’m not sure what else you could ask for. There are guest stars all over the album, including Danny Miles (the Job), Twin Peaks, El Da Sensei, D-Sisive, More or Les and Wordburglar. The album also uses a bunch of live drums, which is a sweet bonus that most hip-hop albums are not going to give you. My personal favourites are “Grown Man’s Dinner,” “Smell the Glove,” “X-Files” and “The New Science,” but I’m not finding any duds here. What to stream, what to stream? Such a tough decision. How about taking a few minutes and checking out the TWM stream of my personal favourite track “Grown Man’s Dinner” and hearing the song for yourself? Keep checking back at the site for more updates daily!